Hello all! I just wanted to say before I really got into the post that I'm not putting up all the Indie Halloween collections. This is mostly because I find the gory Zombie fad quite disturbing and so I just can't bring myself to post the Zombie collections up. In my previous post I literally hummed and hawwed for about 5 minutes on whether to include Meow's Zombie collection, and I did for completeness but that's it I just can't do it anymore! I'm a vampire girl at heart so I apologize but decay bothers me. So I just want to say I have nothing against these brands and their Zombie lines but I just can't deal with some of the promo images/packaging/names. This one hasn't been released yet, but it should be available to buy on the 15th I believe. I can't wait as these swatches from VC's facebook page look gorgeous! 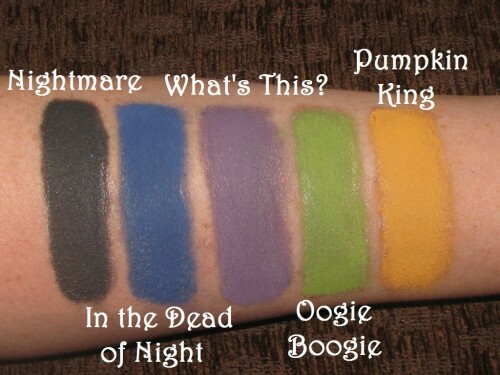 Below is both swatches from the Fear collection and from the Halloween collection. I've mushed them together because I think swatches on skin are helpful and both of these collections will be for sale at the same time. You can see though that I've noted which items are from which collection. Fear is currently available and Halloween as I stated above will be released soon. These are Limited Edition though, I believe VC plans to take these down November 2nd. This isn't the full collection either there is still 2 more loose shadows VC will be adding to the Halloween collection. Aren't they fabulous?! I'm so excited to order from these collections! Curse of the Werewolf just looks amazing. Next up is Morgana Cryptoria. Firstly, she released new Lip Glosses for fall with quite a few halloweenish colours, however they aren't specifically the Halloween release. Two new Lip Glosses (or Ghouloss as they are called on the site) were added for Halloween, as well as an eye themed eyeshadow collection. There will be a new blush called Gravely as well a purple-grey shade, and the lip glosses are now available to buy in sets of three mini tubes with a unique holder. The Gel Lipsticks are going to be coming out soon too. Can't wait! I think there collection image for Geek Chic Cosmetics says it all but I'll let you in on a hint it's a halloween cult classic movie. Fyrinnae is being slightly difficult this season because although some bloggers have gotten the collection, there is no sign of it (or any of their eyeshadows) on their site at the moment and no clue when they're coming back. 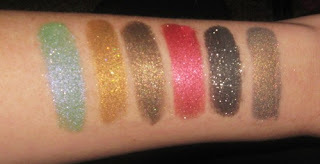 However, here are two girls that have swatched the collection for you so go check them out. I've always had good experiences with Fyrinnae shadows in the past quality-wise and they are much more complex in person than can ever be shown on a computer screen. These shadows are not limited edition so there is no rush for you to order, unless of course if you want to wear any of the shades for Halloween. Two smaller Indie companies that I've not tried anything from (nor do I know much about) are also getting sort of an honourable mention here. RagDolls Bath and Beauty, and Persephone Minerals. Persephone Minerals is known for their Duochrome shades and I know next to nothing about RagDolls Bath and Beauty. The Beauty Spot has also got swatches and a review up of the This is Halloween Collection by RagDolls. So that's it. Crazy right? But I love the halloween collections, everything is always so spooky and well named. Any collections you're definitely going to be buying from? Shades you are on the look-out for? Let me know!